1. At least 5-inch armor plating. Bullet-proof glass windows that don't open. Run-flat tires that still work even if deflated. 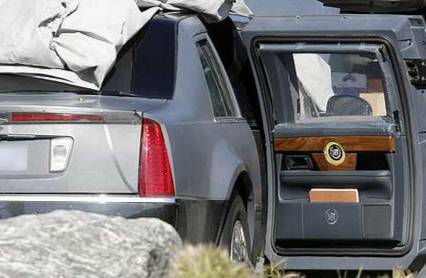 Environmentally-sealed interior seating seven people to protect against a chemical attack. Advanced communications system to keep up with news and developments. Possibly a remote starting system so that explosives set to go off when the ignition or door locks are activated will be set off at a distance. Explosion-proof fuel tank in case bullets hit the tank. 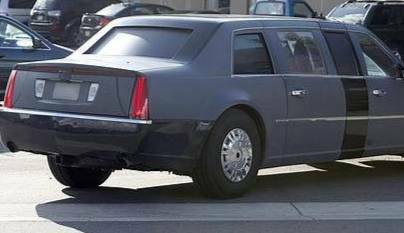 On the aesthetic front, the Cadillac sports a 10-disc CD player, hand-stitched leather interiors, and possibly an iPod dock too. Other details are unknown. A General Motors spokesman said, "One of the specifications is that we don't talk about the specifications." 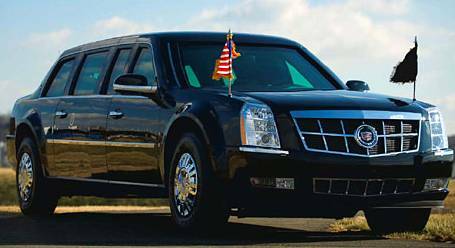 Obama's limo, officially known as the Presidential State Car, will debut on January 20 as part of the inaugural parade down Pennsylvania Avenue.